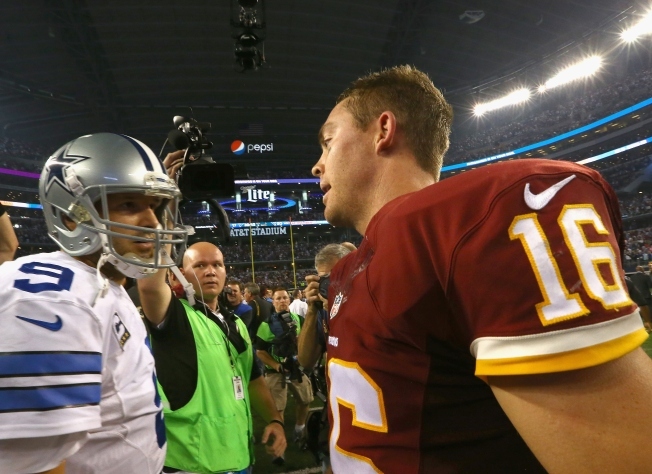 Amid the euphoria of the Redskins' 20-17 overtime victory against the Cowboys on Monday, no one can blame quarterback Colt McCoy's exuberance following his exceptional performance. But when ESPN Deportes reporter John Sutcliffe attempted to interview McCoy, Washington senior vice president of communications Tony Wyllie forcibly pulled the quarterback away. "No no no, we gotta go guys, we gotta go," Wyllie said, hands on his quarterback, attempting to physically move McCoy toward his destination. But there was resistance from Sutcliffe. "No means NO!" Wyllie finally shouted, which became the seminal moment for people attempting to make late-night jokes on the internet. The interview eventually took place. Wyllie explained the now-infamous moment to ProFootballTalk Tuesday morning. According to Wyllie, McCoy was needed in the locker room for a postgame speech from coach Jay Gruden. Sutcliffe had not set up an on-field interview with McCoy, but still attempted to speak to him. Wyllie told News4 he had nothing more to add Tuesday afternoon. "We were just trying to get the player into the locker room so he could hear the post-game speech," he said. "The guy refused to listen about getting the player in."